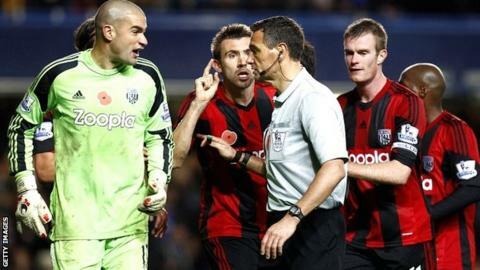 West Brom have written to the Premier League and its match officials asking for video reviews of penalty decisions. Baggies boss Steve Clarke was incensed by the awarding of a late penalty that allowed Chelsea to draw 2-2 with his team at Stamford Bridge last weekend. In his letter, chairman Jeremy Peace sets out four occasions on which he says his team were unfairly penalised. The club wants the option for referees to review footage to be debated at a Premier League shareholders' meeting. In addition to the Chelsea game - in which Steven Reid was penalised for an injury-time collision with Ramires - West Brom claim they were harshly treated in matches against Southampton, Arsenal and Stoke. Without those decisions, they maintain, they would be seven points better off in the league table - and in fifth place rather than 10th. Peace has asked Mike Riley, head of the Professional Game and Match Officials Ltd (PGMOL), to explain the decisions.